Staff Photo BY RACHEL MURPHY—Students at Strough Middle School in Rome practice a scene from Fame Jr. on Tuesday. Front row pictured from left, Noah Nardozza, Madelynn Maiolo and Armando Ciotti. 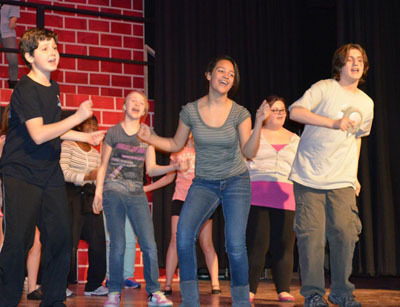 ROME — Strough Middle School students are almost ready for their debut in the musical “Fame Jr.”, which they will perform next week on March 8 and 9 at 7 p.m. It is a bittersweet and inspiring story of a diverse group of students as they go through four years of artistic and academic work. The show also explores issues that confront many young people. “I knew a had a lot of talent coming up from Staley and a lot of talent moving up from seventh to eight grade and ‘Fame Jr.’ has really allowed me to showcase multiple students as oppose to most of the other junior shows,” said Brittany Lynch, chorus and music teacher at Strough and director of the play. “Fame Jr.” has 15 lead parts and creates an opportunity for many students to show off their dancing skills and high energy, Lynch said. Madison Bray, a seventh-grader at Strough plays one of the leads, Carmen Diaz. Bray’s character is on a quest to become a star and nothing is going to get in her way. “Putting me into a character that is really the opposite of me taught me to be more outgoing and be more confident," she said. "I'm doing better in school after the play and I think that I really took away from this character…it's really helping me as a person." Another lead is being played by Helena Mastracco. She is cast as the part of Miss Sherman, an English teacher. Mastracco and the rest of roughly 45 cast and crew members have been working on the play since January, dedicating many hours of practice towards it. Mastracco added that she learned a few different lessons while working on this play. "It's not easy to be famous you have to put a lot of work into anything that you do," she said. The show is being sponsored by the Boys and Girls Club. The proceeds from the show will go towards the club. Tickets are $2 for students or $4 for adults. To purchase pre-sale tickets call the Boys and Girls Club at 315-338-5219.